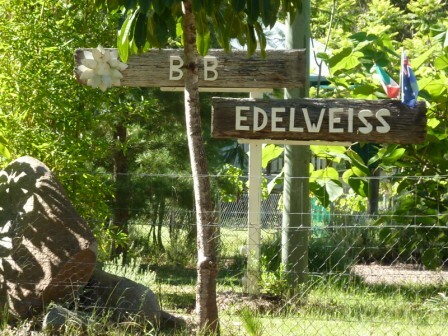 The owners, Lucy and Jack, both of Swiss origin, welcome you to the ''Edelweiss'' with its friendly and quiet environment in the heart of the South Burnett Tourism region in South East Queensland. Lucy and Jack give the B&B a special feeling of traditional European hospitality and a hearty Australian welcome. The property was named after the rare Swiss alpine flower Edelweiss which has become world famous through the endearing movie ''The Sound of Music''. The road to the "Edelweiss" is well signposted. It is located 4.5 km north of the Blackbutt town centre and nestled on a 2 ha property, among towering blackbutts and an ancient stand of grass trees. 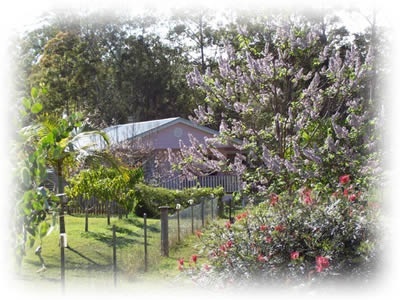 Many flowering shrubs provide a haven for local wildlife and are visited by a multitude of colourful birds such as honey-eaters, lorikeets, wrens, king parrots, kookaburras and cockatoos, a paradise both for the birds and the birdwatchers. A small birdwatching hut stands near the dam which may also be used by stargazers admiring the beautiful and sparkling night sky. At dusk, wallabies sneak in to graze - with a bit of luck, you can watch them from your terrace. Edelweiss House is a unique establishment where our guests can enjoy the calm and serenity of the countryside whilst receiving quality service at affordable prices. One of the chalets is wheelchair accessible. Pets are welcome and there is even a horse paddock available for riders who wish to use the Brisbane Valley Rail Trail or one of the many horsetracks in the area. Our region offers a wide variety of places to see, things to do, possibilities to practice your favourite sport or visit a winery. For detailed information, consult our 'Links' section, unlock the "Magic of the South Burnett", discover the Brisbane Valley Rail Trail, go hiking in the Bunya Mountains National Park or spend an evening stargazing at the Kingaroy Observatory. The bustling city of Brisbane, the Garden City Toowoomba and the sweeping beaches of the Gold and Sunshine Coasts lay within easy reach - just a 2 hour drive away. Lucy and Jack are confident that you will enjoy your stay as much as they will enjoy your company. Best wishes for all your travels, have a safe and pleasant journey and we hope to see you soon at the "Edelweiss"